Judging from the behaviors of many Americans at this time of year, I’m sure that many of my international grad students think that this American holiday is all about overeating, football and frenzied shopping on Friday. What are you grateful for this year? How is God blessing you these days? Have a blessed and peaceful Thanksgiving, all! 1 Ph.D. plus 1 Ph.D. = brilliance? Here I am at National Airport in DC, the morning AFTER I was supposed to return to Detroit…it’s a funny story, so I thought I’d share the laugh with you all, and I have the blessing of the other person involved, as most of you who read this won’t know who she is. So I spent a couple of nights with Sr. L after my board meeting in DC on Thursday, and yesterday we spent much of the day running back and forth to Circuit City trying to get what we needed to set up a wireless network for her and another sister to share….the brick walls turned out to be insurmountable, so that was time spent with no results… For my efforts, Sr. L treated me to a late lunch, which we enjoyed very much – so much so that we lost track of time and were running just a bit behind for the airport run. So we hurried up and paid the bill, and then got on the road…we passed the exit for I-95 south, and when it looked like we were going to get on I-95 north I asked Sr. L about that, since National Airport is in Virginia, south of where we were. Her expression was priceless! Apparently, I had never told her what airport I was using, and she never asked me. So she had worked out the timing for our airport run based on my flying out of BWI! Needless to say, the rest of the story is a bit reminiscent of the Keystone Kops. We got turned around, realizing that there was no chance for me to catch the flight unless it was significantly delayed. Sr. L was running a bit low on gas, which would delay us even more. But she kept driving like crazy while I got on the cell phone to Northwest to see what could be done… the reservation agent informed me that there were no more flights to Detroit that night, but that I should still show up at the airport and hope that the ticket agent would have mercy on me and rebook me without charging me the change fee and other costs. So, we made the brilliant decision (this one really WAS brilliant) to drop me at Metro to get there faster, and guess what? It did pay off, as I approached the ticket agent with sincere contriteness and calm, and she took care of me. Then back to Metro and Sr. L for the evening. I told the sister living in the next apartment that I came back just to say goodbye to her and to watch another video with them. We had a good laugh about the whole thing…just goes to show you that advanced degrees don’t guarantee simple common sense! 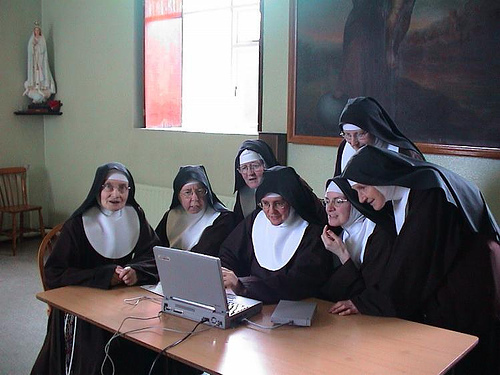 Wiki nuns – look out world! Part of our charism as CSJs is to try to bring about union with God, among ourselves, among others. So as a “techie nun” I’m always looking for ways to put technology at the service of the charism. And with a little patience, I’m able to bring on board sisters who are a little unsure of themselves with respect to computers and hopefully give them a little confidence in using the tools I’m introducing to them. Maryknoll Fr. Roy Bourgeois has been threatened with excommunication by the Vatican’s Congregation of the Doctrine of the Faith for his support of women’s ordination, according to a letter made public today. With Proposition 8 on the November ballot, and his own bishop urging Central Valley priests to support its definition of traditional marriage, Farrow told congregants he felt obligated to break “a numbing silence” about church prejudice against homosexuals. Then Farrow — who had revealed that he was gay during a television interview immediately before Mass — added a coda to his sermon. At this time last year, I was a bit of a mess. A combination of season change, work stress, and brain chemistry conspired to catapult me into a rather intense and tenacious bout with anxiety and depression. One thing many religious communities have right is the encouragement and support for sisters to attend to all aspects of their health, including mental health. So when I realized what was happening, it didn’t take me long to seek help. As for the miracle, I thought I’d respond to the request on behalf of the drummer, Shawn Bost, who has been waiting a long time for a kidney. The Milwaukee Journal Sentinel wrote an article about Shawn’s plight last December (link below), and I thought I’d get the word out just in case any of you or someone you know might feel called to respond. Thanks to those of you who have been praying me through my week of health challenges and work stress. I got a long overdue set of project reports graded, and made a good dent on reviewing my doctoral student’s dissertation. Still not caught up with everything, but not feeling as far behind as I was. My upcoming travel schedule is still a bit daunting, but I’ll have more time to work on the next couple of trips, so it shouldn’t put me further behind. Today, can we just be Americans? Well, I’m sure most folks around the world know that we here in the U.S. are having presidential elections today. And it’s no secret that the weeks leading up to this day have been full of bombast and divisive rhetoric along party lines. So I’m happy to say that everything about my voting experience today was pleasant. For some reason, the usual folks handing out fliers to voters as they arrive were not present. The polling place had additional booths and workers in anticipation of the large turnout. (There were only three people in line ahead of me at 9:45.) And best of all, for my precinct, there was a team of 20-30 somethings staffing the sign-in table. Don’t get me wrong, I appreciate the “old ladies” who usually draw this duty…I just really find it heartening to see younger folks get so actively involved. to bring safety to the whole world. without taking resources from others to achieve it. of other parts of this globe. and hearts that trust in your eternal care. Amen. by Sr. Joan Chittister, O.S.B.